Over the weekend, I was thinking about our living room. It’s not unusual for me to think about our spaces and how they are working for us or not working; or, what I would love to do to our spaces or what I could envision for a particular space. It’s not unusual at all, much to Luke’s dismay (actually, he doesn’t really care but I think he’s secretly glad that I talk about all of this with you more than I talk about it with him). 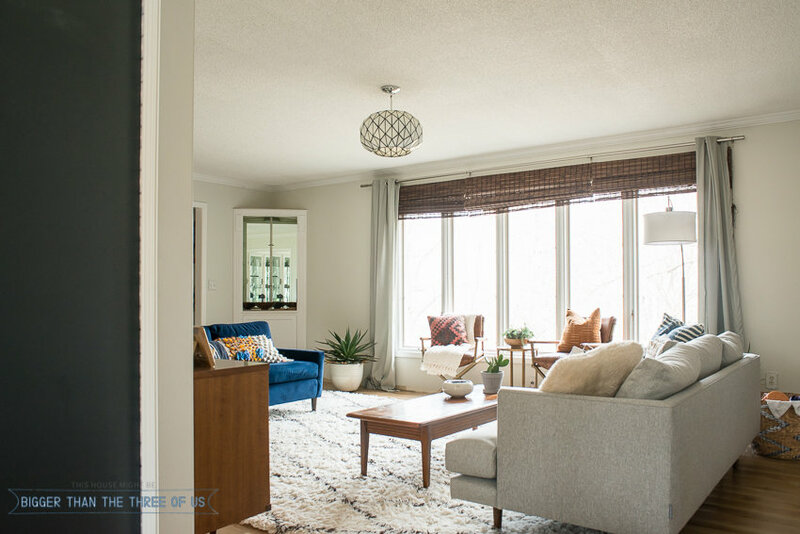 I poked around on the blog and realized that it’s been months since I’ve shared our living room, so today I wanted to share our Ever-Changing Modern and Bright Living Room with you. It’s not a reveal. It’s nothing crazy different. This is just how we are living within the space at this present moment. 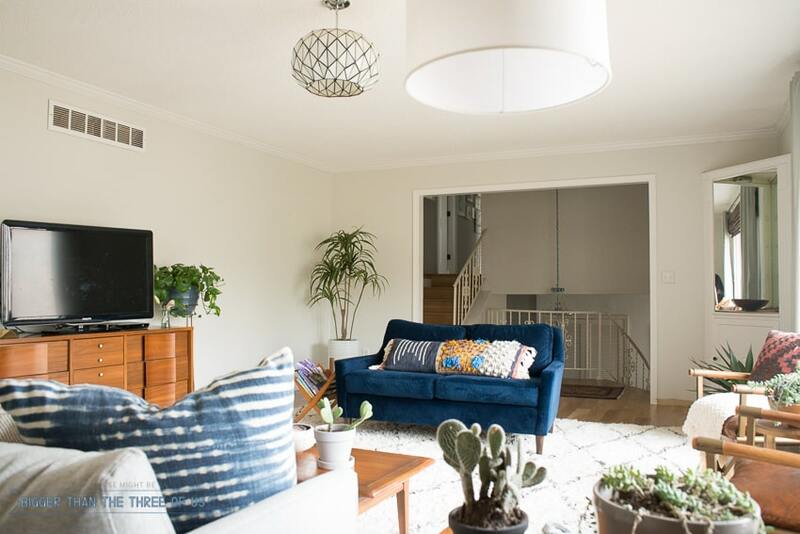 One of the last times I really posted about the living room, I posted about the evolution of the space (if you want to see the before and way before – check out that post). Early fall, I found my Mid-Century Chairs on Craigslist and shared those and how they fit into the space. The Mid-Century chairs are flanking that little table by the windows. I still really love those chairs and think they work with the overall feel of the space so well. They are probably a bit on the petite side for our larger living room. 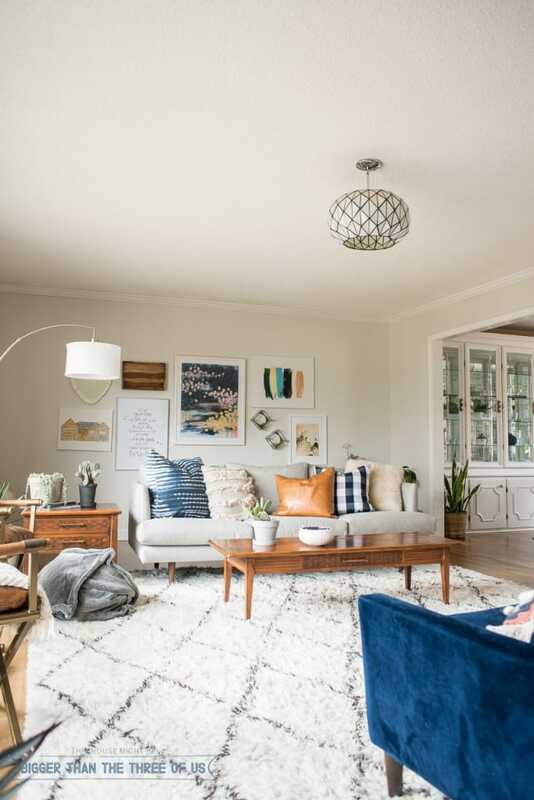 I read an article sometime back and it talked about how you really have to consider the size of your space for everything from rugs, to lamps to furniture. I think I’ve done that with the rug, for sure, but not so much with the furniture. In hindsight, although I love our little blue sofa, it probably wasn’t the best purchase for us; when keeping in mind scale of furniture to living room dimensions. Even though our living room has “stuff” in it and furniture in it, it has never felt complete and I think that’s due to the sizing of the furniture that we have. I love clean, more mid-century lines and those type lines are usually more on the petite side of things. So, I don’t really have a solution, I’m just aware of what I think could fit the living room better long-term. My awesome breakthrough in buying larger-scale furniture for our larger room didn’t come until after we purchased a new sofa (above). It was time to get a new sofa for our living room, so we bought this Article sofa early last fall. It’s about the exact same size as our last sofa and has the modern lines that I love but I do think we could have gone larger. 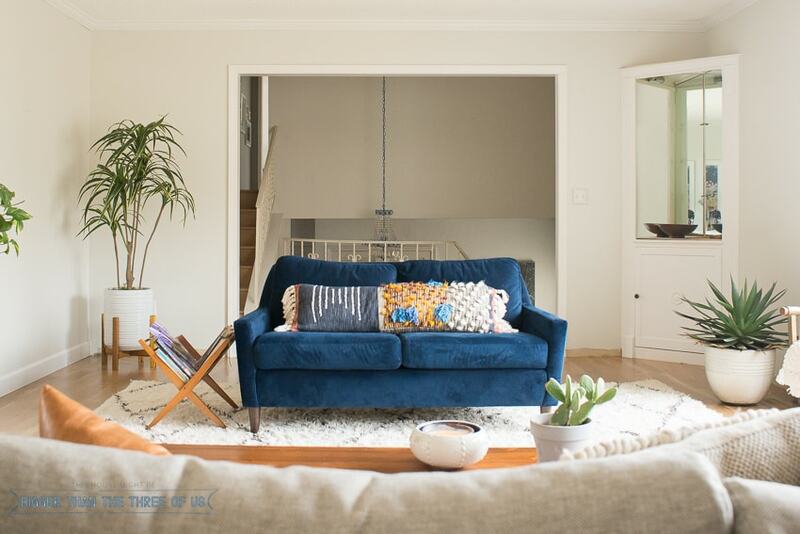 All of the sizing proportions aside, our living room feels cohesive and semi put together. 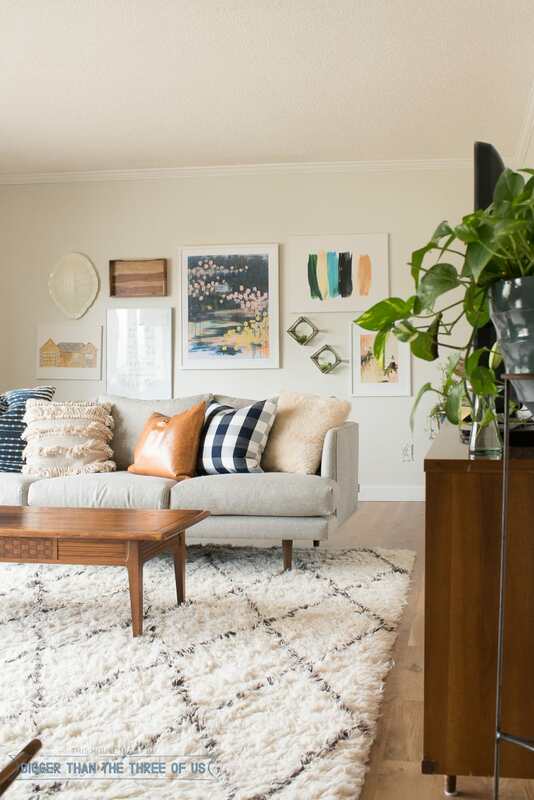 We still have things that we want to add (hey baseboards, I’m talking about you), take down (looking right at you gallery wall) or change (awkward corner built-in – you still puzzle me). 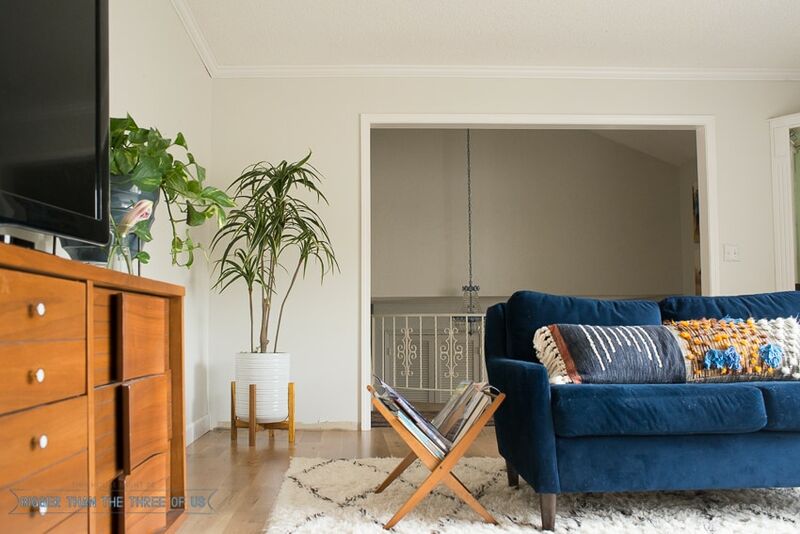 See that corner plant – the larger one? I found that at Marshalls last month. It’s fake but totally feels/looks real. I love how it adds life to the lonely corner. I’m not sure what I will tackle and when in this room. I’m happy to live in the space right now and kinda let it continue to evolve. 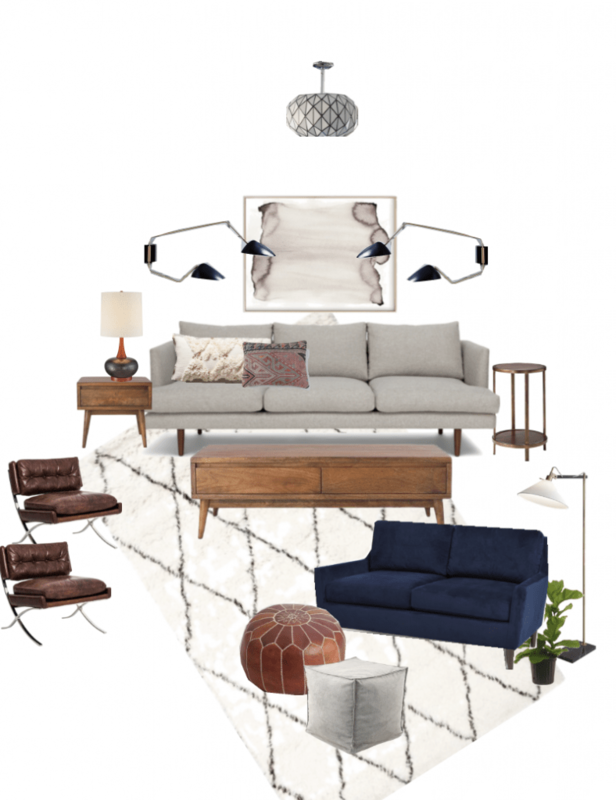 Lots of the same components but maybe a larger coffee table and something more neutral on the wall behind the couch. 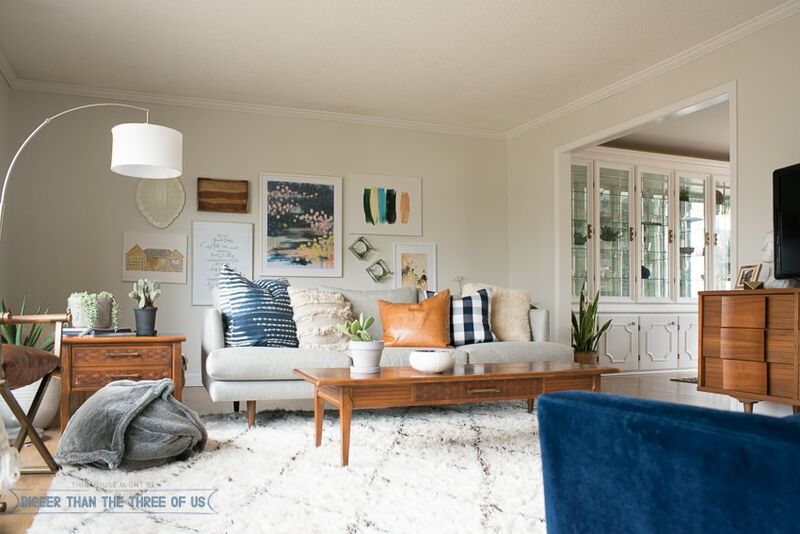 But seriously, I’m happy where we are at and, unless something just falls into my lap… you probably won’t see another living room update for at least another six months or so. *Affiliate links below. Click to read my disclosure policy. Thanks for supporting this blog.